"Juggling angry Russians, the British Mi5, and an international terrorist, debonair art dealer and part time rogue Charlie Mortdecai races to recover a stolen painting rumoured to contain a code that leads to lost Nazi gold." As I've moved further and further away from the purest forms of the horror genre with nearly every review this year (mainly because there aren't any new horror movies left other than a few bottomfeeder indie ones on the VOD streams which I'm not likely to ever care about anyway), I thought that I might as well watch something completely different for this "Surprise Sunday". Although I freely admit to disliking comedies in general (especially since the American ones are usually more spiteful and mean-spirited than horror), sometimes people need a little bit of comic relief in their lives. I have no problem with that. Just because comedy isn't really meant for me, it doesn't mean that I can't still objectively appreciate the merits of a film within that genre. Drama is drama, and a good story will usually entertain me regardless. Thus, I decided to watch "Mortdecai". Having heard nothing but bad things about this R-rated box office flop from the "critics" (and the usual snarky assholes all over the internet), I also set myself a challenge to see if I would agree with them or end up being a contrarian. This is the poster. Obviously. Unfortunately, despite "Mortdecai" having a great cast of credible acting talents, a huge budget, and quite beautiful camerawork in places, I have to come down on the side of the critics. 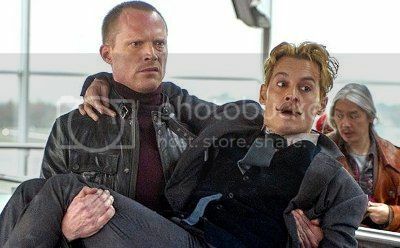 "Mortdecai" looks like a Brosnan-era "James Bond" film, but the story is both confusing and drawn out in equal measures, and the best thing it has going for it is the amusing Johnny Depp and Paul Bettany double-act which reminds me (and everybody else) of Inspector Clouseau and Cato (albeit with British accents). I've never actually watched any of the "Pink Panther" movies in their entirety, mind you, but I saw substantial parts of most of them on television as a child. Mainly due to clip show quizzes such as the BBC's "Screen Test", some of the slapstick fighting scenes stuck in my memory. Therefore, whether the homages in "Mortdecai" are intentional or accidental, I have no real way of knowing. I have absolutely no desire to ever attempt to watch them again. Fans of Inspector Clouseau, however, will know for sure. No funny caption for this. Something about carrying the film, maybe? Moving on to things which I can properly appreciate, the stunts are very good, the locations were well chosen and dressed beforehand, and I don't have any real problem with the script. Other than Johnny Depp channelling Terry Thomas, none of it is that funny though, and the moustache gags are very repetitive and overused. 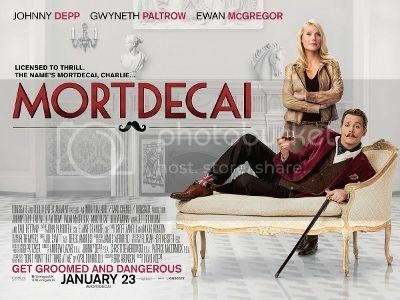 "Mortdecai" also clearly suffers from pacing problems and padding more than a few times, but that still doesn't completely wreck the somewhat challenging non-linear narrative which is its own worst enemy. Including small roles for Paul Whitehouse (who Brits like me tend to love) early on and Jeff Goldblum two-thirds in, the main problem with "Mortdecai" is that it doesn't allow any of the supporting players apart from Ewan McGregor to really stand out. Although I'm pretty sure that nobody involved wanted to create anything other than a Depp-centric product to entertain an audience for an hour and a half, sadly, it shows. "Mortdecai" won't be winning any Oscars or major awards (unless the world goes even more batshit insane than it has done in the last two years), and it's not the most original comedy-spy movie that I've ever seen either, but it's relatively okay for what it is. It's not as good as any of the "Austin Powers" movies by any stretch of the imagination, but it has many intentionally amusing moments and a couple of extremely nauseating ones.